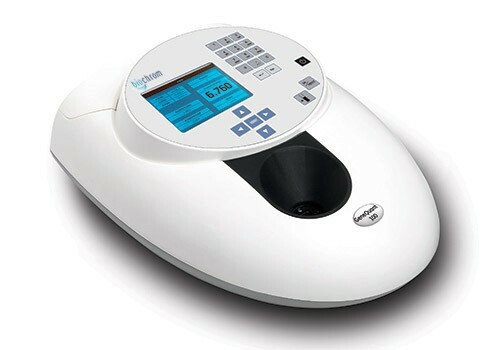 GeneQuant 100 is designed to measure the concentration and purity of nucleic acid and protein samples, and the density of bacterial cell cultures at a broad range of sample volumes. It can be used with a variety of cuvettes for sample volumes from 3 µl to 2 ml. Samples as low as 3 µl can be analysed using a capillary cell system. A wide range of standard cuvettes may be used depending on the sensitivity or volume requirements. The 15 mm optical beam height makes the GeneQuant 100 compatible with low volume quartz and disposable UV- transmitting plastic cuvettes. Relevant parameters are calculated automatically and displayed at the touch of a button on a large display. • Large, easy-to-read graphical display. • Optional built-in printer or output data via USB to a PC for printing or storage. • Predefined methods for nucleic acid purification, protein assays and cell culture density measurements. • Optics with no moving parts for high energy throughput combined with a Xenon source for long lamp life time. • Can also be operated from a PC with optional Datrys software. Data Output Output data via USB to a PC as standard. Built-in printer or wireless bluetooth connectivity options available.